How do you choose between a fixed-rate mortgage and an adjustable-rate mortgage (ARM)? Conventional wisdom has been that if you can obtain a fixed-rate mortgage at about 6 percent or less, you should lock in that rate for as long as possible. However, for some people, an ARM makes sense. Imagine that you bought a house and had the following mortgage options: a 30-year fixed-rate mortgage for about 6% or a 3/1 ARM at 4.625%. You expected to stay in the home for three to five years and definitely not more than seven. A “3/1 ARM” means that your initial rate of 4.625% is locked in for three years. 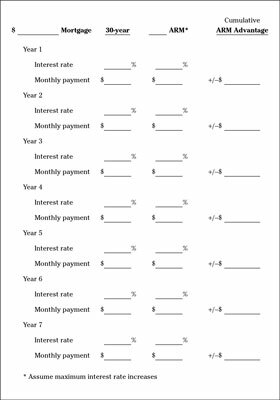 At the end of the three-year period, if interest rates increased, your rate could go up a maximum of 1 percent each and every year. Given the substantial difference at the time between a 30-year fixed and a 3/1 ARM, in the worst-case scenario, you would reach the point where you would break even in year seven. If you’re in a similar position (not planning on staying in a property for more than five or eight years) you might be best served with an adjustable-rate mortgage. However, the decision depends on the differential between the 30-year fixed mortgage rates and interest rates available on 3/1 and 5/1 ARMs. For up-to-date rates on all types of mortgages in your area, visit Bankrate, which provides information, quotes, and calculators to assist you in making informed decisions about your home-financing options based on rates available in your market at that very moment. Your local newspaper likely also publishes current mortgage rates available in your market. You can’t normally find much benefit in taking an adjustable-rate mortgage compared to a fixed-rate mortgage. However, when the difference between a fixed rate and an ARM is 0.5% or more, and you have a high likelihood that you won’t be in the property much longer than the fixed term of your adjustable-rate mortgage, you can save money by selecting the ARM. To determine the monthly principal and interest due on a mortgage balance at a specific interest rate, use the mortgage calculators at Bankrate or Nolo. 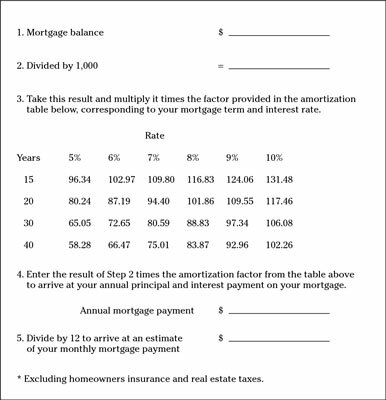 If you don’t have access to the Internet or a financial calculator, you can estimate your annual mortgage payment with the Estimating Your Mortgage Payment Worksheet, provided here. After you know the current interest rates available in the marketplace and the approximate amount of your monthly mortgage payment, you can decide, based on the numbers, whether a fixed-rate or adjustable-rate mortgage is better for you and, if so, for how long. Your break-even point is the point in the future when the cost of one type of mortgage meets the cost of another. Use the worksheet provided here to figure out your break-even point.